Child Sponsorship – Your Story? For a number of years, my wife and I have supported three boys through IGL’s Child Sponsorship Program. Through Christmas cards, pictures, handwritten letters and coloring pages, we’ve been watching our three boys grow up! I was always amazed that for just $30 per month, India Gospel League could deliver education, food, medicine, family-style living and Christian teaching, love and care to a child (providing all that for my own 6 kids in the U.S.A. costs a bit more than that)! 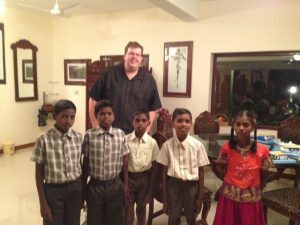 A great surprise came last January, when I went to India and had the opportunity to meet my sponsored children. Into our tropical meeting spot in Tamil Nadu trekked not three, but five children! Here, my last name (Jarvis) was also attached to the child that my parents have been sponsoring, and one that my sister has sponsored for the past few years. So they collected these kids from across the region and brought them together. I did a lot of through-a-translator apologizing to the “extra” kids that showed up, since I didn’t have gifts for them. But I did pass along lots of family news and good tidings. One of the five had just finished an eight-hour van ride to be able to see me. Then it was time for a FaceTime call back home, so that my Indian kids could talk to my American kids! That was fun, and a bit humorous. The time difference meant that for my kids in the USA, this was 3 a.m. Not exactly their best conversational performance, but at least one of them was awake enough to participate! The kids who had prayed for one another before bed for years could finally talk, face-to-face! What I saw in the IGL children’s homes was everything I could have wished for in a child sponsorship program. Solid biblical teaching, creative and thorough education, loving house-parents, a Jesus-centered atmosphere. And PLENTY of smiles to go around. If you are interested in sponsoring a child, I’d encourage you to browse some current profiles here. Each one of these kids has a story that goes so much deeper than a picture and the paragraph can communicate. Each one has hopes, dreams, needs, hurts, and laughs. I’d encourage you to be a part of their story, and let them be a part of yours. If you have a story of how sponsoring a child has impacted your life or worldview, feel free to share it in the comment section below!